Please note that any use of glyphosate herbicide in any form should be considered as a last resort to minimize unintended environmental impact. Plant Taxonomy: Family Simaroubaceae Genus Ailanthus Species: altissima (P.Miller) Swingle (Synonym: A. glandulosa) (Magee and Ahles, 2007). Regulations: The importation, distribution, trade, and sale of tree-of-heaven have been banned in Massachusetts effective January 1, 2009 (Massachusetts Prohibited Plant List website, 2012). Brief history. Tree-of-heaven is a fast growing, deciduous, exotic invasive tree that is able to germinate and grow in a wide variety of soil and site conditions proving that it has been and still is troublesome from urban landscapes to woodlands. It can reach a height of 80 plus feet tall, has become naturalized in most of the United States, and grows in a wide variety of other habitats including, but not limited to, forest edges and gaps, grassy fields, roadsides, backyards, local parks, agricultural fields, and reclaimed surface-mined lands (Miller, 1990; Somers, Kramer, Lombard, and Brumback, 2006). 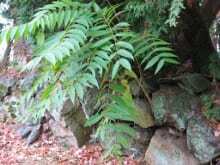 Mostly observed in cities and towns as a tree growing out of place, tree-of-heaven frequently is seen growing out of the cracks and crevices of stone or cement patios, sidewalks, close to building foundations and bridge abutments, and out of stone walls. In fact, tree-of-heaven grows almost everywhere in the built environment where there is enough soil to support its germination and seedling growth stage. I have removed it from alongside buildings, out of the cracks of building foundations and tarred parking lots, and from paved walks and roadways, stone walls, and suburban woodlands. Tree-of-heaven takes advantage of stone walls and broken pavement. Tree-of-heaven is a native of China (Dirr, 1998; Dame and Brooks, 1902) and in 1751 was mistakenly introduced into France and England by a missionary who thought it was a Japan varnish tree (Burch and Zedaker, 2003). From England, it was first introduced to the United States as an exotic, fast growing, ornamental shade tree in Philadelphia, PA in 1784 (Dirr, 1998; Miller, 1990). In Philadelphia, tree-of -heaven sparked the interest of amateur and professional horticulturists alike as a desirable and unique shade and ornamental tree for the gardens of larger home and farm landscapes (Dirr, 1998; DiTomaso and Kyser, 2007). The seeds and seedlings were sold and traded between interested people wanting to beautify and shade their own towns and agricultural landscapes. The second introduction occurred thirty-six years later, in 1820, at Flushing, Long Island, NY. At this time the seeds and seedlings were more widely publicized, planted, and cultivated by the nursery trade and plant enthusiasts, again, as a unique and fast-growing exotic shade tree (Fryer, 2010; Dame and Brooks, 1902). Tree-of-heaven’s popularity even increased beyond the commercial nursery trade! For example, Dame and Brooks (1902) reported that the seeds of this new arrival were distributed by the U.S. Department of Agriculture. During the early 1900s, botanical workers of the USDA explored Asian and European countries for plants that could be used in the U.S. for the betterment of private and public agricultural, horticultural, and botanical projects (Devine, 1998). Little concern was shown at that time for weedy characteristics or invasive traits of these new introductions. Foreign plants were not viewed by most people as being pest-like as they are now. The USDA, by 1923, had introduced more than 50,000 exotic plants into the U.S., only a few being classified decades later as invasive species (Devine, 1998). Years later, similar efforts were carried out by other government agencies such as state highway departments, the Army Corps of Engineers, and the Soil Conservation Service. These groups, although well intended at the time, were responsible for some of our current exotic invasive plants wreaking havoc in our landscapes (Devine, 1998), including glossy buckthorn, Rhamnus frangula, multi-flora rose, Rosa multiflora, and kudzu, Pueraria montana, to name a few. Similarly, the same type of ‘plant explorer’ projects coupled with the ‘exotic plant gardenbeautification’ mindset had occurred for decades in England and other European countries. For example, in England during the early 1900s, Burbidge (1910) advised, in a very popular gardening book of the time, that the hardy tree-of-heaven be used as large groupings in flower and shrub gardens to shelter tender annuals from the harsh effects of sun and wind. In the U. S., Ernest Wilson, famed plant explorer in Asia and other exotic places, worked for the Arnold Arboretum to collect exotic plants to test for American gardens, some of which turned out to be invasive. In his book, Aristocrats of the Garden, he described tree-of-heaven as “a very old inhabitant of gardens….” (Wilson,1932 p.172). Therefore, as Wilson noted in 1932, tree-of-heaven was already here, thriving in gardens, naturalizing in adjacent woodlands, roadsides, and fields, and becoming more noticeably ‘weedy’ at a distance from where it was intentionally planted. The third U.S. introduction of tree-of-heaven took place in California during the mid-1800s. The immigrant Chinese work force during the Gold Rush era brought this species to their new homeland. They used the bark and fruit for medicinal purposes and valued this tree as a cultural reminder of their homeland, China (Fryer, 2010; Zheng, Wu, Ding, Fu, and Reardon, 2006). Why the early popularity of tree-of-heaven? Fryer (2010) states that the scientific name, Ailanthus (i.e. sky-tree) and the common name, tree-of-heaven, refer to this tree’s ability to grow towards the sky very quickly. Great marketing for the day. It was touted as a unique, fast growing, ornamental shade tree with a demonstrated ability to grow in a wide range of soil and site conditions. The marketing of this tree by plant enthusiasts matched its performance! In these early days of American horticulture, air conditioning, as we have come to know it, was instead, provided by the planting of shade trees. 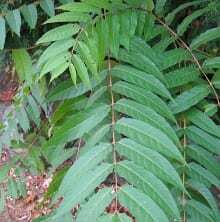 Tree-of-heaven was a desirable tree for everyone’s garden because it provided quick shade and unique ornamental value. By the early 1900s however, tree of-heaven began losing popularity due to its prolific root sprouting and weedy nature in human-occupied areas coupled with the foul odor of its stems and leaves (DiTomaso and Kyser, 2007). Presently, in this new era of exotic invasive plant awareness, Dirr (1998), states that tree-of-heaven has no horticultural value because there are many other tree species of better quality for designed landscapes. Similarly, Whitcomb (1985 p.51) states that although it is an “indestructible tree” it “should be avoided”. Tree-of-heaven seeds or seedlings have been planted in most of the continental U.S. and have escaped from those original planting sites, except in the tree-of-heaven free states of Montana, Wyoming, North Dakota, South Dakota, and Minnesota (Anonymous, 2006; Zheng et al, 2006). Brief botanical information. Tree-of-heaven has a slightly rough pale gray bark with lightly colored striations giving the appearance of “reptile-like skin” on more mature trees. Stems are chunky and yellowish to reddish brown in color (Dirr, 1998). 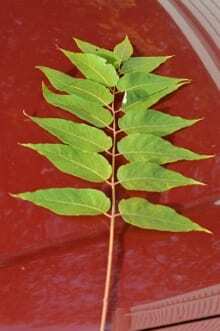 This species has large alternate, pinnately compound leaves containing 13 to 40 or more leaflets; individual leaves (leaflets) are three to five inches long and one to two inches wide, each with characteristic glandular “teeth” or bumps located at the base of each leaflet (Dirr, 1998; Fryer, 2010; Whitcomb, 1985: Magee and Ahles, 2007). Close-up view of leaf glands. The leaflets are lanceolate and leaflet margins are smooth (i.e. entire; without serrations) (Magee and Ahles, 2007). To the beginner, leaflets resemble sumac (Rhus spp.) (Hunter, 1996). Again, the bases of the leaflets have one to two protruding bumps on the leaflet margin commonly referred to in the literature as glandular teeth. 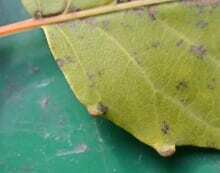 These bumps are diagnostic to species identification. See Appendix. The lateral bud is not enclosed by the shield-shaped leaf scar. There may be two or more leaf glands per leaflet. Leaf scars (i.e. 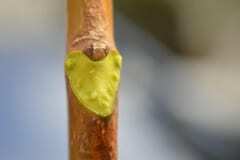 the area exposed when the compound leaf is removed from the stem) are shield-shaped with the lateral bud not enclosed by the scar. Bundle scars are in a curved line (Magee and Ahles, 2007) and number about nine (Harlow,1959). Bundle scars reveal breakage points of the vascular conducting tubes from the stem to the compound leaf (Harlow, 1959; Dirr, 1998). Terminal bud is lacking and the lateral buds are small (1/16 of an inch), solitary, brown colored with brown soft hairs (Harlow, 1959; Dirr, 1998). Seed on the tree is formed in a single-celled, one- to one-and-a-half-inch twisted samara. There is one seed per samara, which is also called a schizocarp (Little, 1974; Fryer, 2010; Dirr, 1998). These single-seeded samaras are wind dispersed and have been documented as traveling a wind-carried distance of 299 feet (Fryer, 2010). The samaras or schizocarps grow in groups or clusters on the tree. The whole cluster rarely falls to the ground. When ready, individual samaras or samaras in smaller groupings fall to the ground assisted by gravity and/or the action of wind. (1) Seeds are able to germinate and grow in a variety of soil and site conditions. This exotic invasive tree seed can germinate and become established in a broad range of soil and site conditions. Whitcomb (1985) describes this trait well when he states that tree-of-heaven can germinate and grow in areas of limited soil availability (e.g. cracks in sidewalks), nutrient poor soils, and salty roadside soils. They also can tolerate air pollution, high heat, and strong winds. Harlow and Harrar (1969), reveal that this species can tolerate compacted soils. However, Tree-of-heaven cannot tolerate prolonged wet and flooded soils (Miller, 1990), but it can survive in dry soils and tolerate droughty conditions once it becomes established (Miller, 1990; Fryer, 2010). (2) High seed production and good seed viability. Tree-of-heaven has high seed production, but low soil seed bank viability. Every document written about this tree describes its prolific seed production. Fryer (2010) states that the largest quantity of seed is produced by trees between the ages of 12 and 20 years old – all the more reason to remove young trees during early-detection control programs. Some trees have been reported to produce more than 325,000 seeds in one year (Fryer, 2010). Even though tree-of-heaven can grow in a wide range of soil and site conditions, seed germination and seedling establishment is sparse or limited as compared to the amount of actual seed produced. For example, laboratory germination tests of (cold) stratified seeds revealed an average germination rate of approximately 50 percent (Little, 1974). 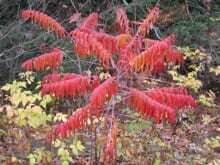 Fryer (2010) reported a spring germination rate of 30 percent for seeds that overwintered on parent trees. Laboratory and field germination test results vary considerably for tree-of-heaven. For example, Little (1974) cited USDA research revealing a germination oddity, that seed stored for over one year had a germination rate of 75% even though the seed storage temperatures ranged from 20˚F to 105˚.F. However, as we have all come to know, not every seed in nature that germinates survives to continue growth and establishment, and this is the case with this species. Tree-of-heaven seeds have no endosperm and have a sensitivity to fluctuating moisture and temperature regimes (Little, 1974) which explains, under natural conditions, the inconsistent and/or reduced germination rates. In addition, soil seed bank seeds have a dormancy of less than one year (Fryer, 2010), one major reason for its sporadic distribution in environmentally favorable areas. (3) Vectors. Tree-of-heaven schizocarps contain one seed and therefore can be effectively carried by wind currents up to 300 feet, maybe more. Schizocarps that fall into water can be effectively transported long distances; agricultural machinery transport has also been documented (Fryer, 2010). (4) Above ground and below ground growth is rapid. In sunny environments, tree-of-heaven exhibits rapid stem and branch growth. Corresponding below ground growth of roots is also rapid. Fryer (2010) and Miller (1990) report that during the early stages of rapid stem and branch height growth, roots simultaneously concentrate carbohydrate reserves very effectively into storage for later use to support top growth and for drought tolerance. This dual shift in metabolic activity supports later season root growth, as well as root and stem sprouting. It is a point worth remembering that this type of metabolic shift of carbohydrate resources helps protect a species during periods of drought. Once tree-of-heaven is growing in the right conditions this trait becomes a major contributor to it being invasive. (5) Sexual reproduction breeding system. This species is mostly dioecious, i.e. male and female flowers are located on separate plants (Symonds, 1958). The light green colored flowers appear from April to May arranged in a multi-branched inflorescence (i.e. panicle) (Zheng et al, 2006). The pollen producing male flowers have a smelly or foul odor that helps in attracting some effective pollinating insects such as certain flies, honey bees, many solitary bees, and some beetles. More male flowers are produced than female (pollen receiving) flowers. Pollinating insects visit both types of flowers ensuring adequate pollination leading to the development of viable fruit and seed; seed production is high (Miller, 1990; Fryer, 2010). The fruit (samara or schizocarp) appears from August into October (Zheng et al, 2006), and some fruit can remain attached to the tree into the winter months (Hunter, 1996; Petrides, 1998). Both male and female plants must be in close enough proximity to be fertilized by pollinating insects. Non-seed bearing trees, which are more common in urban areas than in woodlands, may either be a lone male or lone unfertilized female tree. Horticulturists had a preference for female trees because they lacked the foul flower odor. This specific selection or landscape design choice probably has contributed to curtailing tree-of-heaven’s spread in some areas. (6) Vegetative or asexual reproduction (i.e. sprouting). Vegetative reproduction occurs when stems are cut or broken. For both male and female trees, sprouting produces more potentially reproductive stems than the original uncut or unbroken stem. Tree-of-heaven is an excellent stump sprout producer (i.e. it recovers quickly by sprouting new stems from the stump after being cut down). Stump sprouting also occurs when main stems are broken by falling branches of adjacent over-story trees or by heavy snow and ice loads during winter. Stump sprouting can occur in a single season. Harlow and Harrar (1969) state that one researcher measured the growth of stump sprouts as growing one inch per day and a record season’s growth of 12.6 feet in height. (7) Predator avoidance and / or deterrence including allelopathy. In suburban and woodland settings, white-tailed deer (Odocoileus virginianus) find tree-of-heaven unpalatable as a food source (Fryer, 2010). Leaf unpalatability partly contributes to this species flourishing in early successional stages (Fryer, 2010). 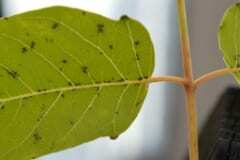 In addition, it has been demonstrated that the toxic compounds from leaf decomposition (i.e. toxic leaf leachate) exhibit allelopathic effects that help tree-of-heaven outcompete native plant associates in forest succession as well as in the less competitive situations of the built environment (Miller, 1990; Fryer, 2010). Toxic leaf litter leachate weakly, but effectively, serves this species by enabling it to compete better for space, water, nutrients, and light by inhibiting the root growth of some competing native and non-native plant species while tree-of-heaven rapidly grows. (8) The timing of leaf out and of leaf loss. Leaves emerge very early in the spring before most native plants, and this species holds onto its leaves a little longer in the fall than most native plants. Fall leaf color is yellow-green to yellow and occurs somewhat later than when most native plants exhibit fall coloration. However, spring leaf emergence could be inconsistent with surrounding vegetation. For example, Fryer (2010) reports about a 1912 observation on Nantucket Island, Massachusetts that this species had very little leaf emergence by early June. As of May 6, 2014, tree-of-heaven’s leaf buds at The Country Club, Brookline, MA are swollen but not exposing leaf tissue. It’s possible that environmental conditions may affect leaf emergence in some areas. With this species a slow start does not translate to slow growth. However, early leaf emergence coupled with maintaining green leaves longer in to the fall allows tree-of-heaven to gain a slight head start over many native trees and shrubs by producing more carbohydrate and other compounds in the leaves for a longer period by way of photosynthesis and by transporting those products to the roots for storage to ensure better winter survival and spring growth. (9) Shade/sun tolerance. Tree-of-heaven is shade intolerant. When it colonizes a woodland mix of deciduous and evergreen plants or an evergreen gap it does it quickly, taking advantage of available sunlight. 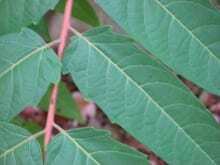 Tree-of-heaven grows faster than native plant associates. This species, being shade intolerant, requires its top portion or crown to be in sunny exposures for adequate and fast growth. The shadier the area becomes over time, the more its growth rate declines. Therefore, the shade intolerance (i.e. light loving) characteristic predicts that tree-of-heaven grows best in full sunlight, and at times, partial sunlight, and demonstrates best growth on open, disturbed sites (Somers et al, 2006; Fryer, 2010). (10) Time of year of fruiting. This species flowers from April through May and fruits from August through October; fruits persist into the winter months (Zheng et al, 2006; Magee and Ahles, 2007; Fryer, 2010). As mentioned above, Fryer (2010) reported a spring germination rate of 30 percent for seeds that overwintered on parent trees. Tree-of-heaven is dioecious and insect pollinated. 1. Cultural Controls: Monitor or visually inspect your property for tree-of-heaven. Do this at least every June and September. As stated in Part II, IPM Control Strategies for Exotic Invasive Plants, prevention is a cultural control of great value. Do not plant or encourage the planting or transplanting of this species. Educating others (e.g. clients or neighbors) about the dangers of this pest is another cultural control of enormous value. 2. Mechanical Controls: Pull, dig, or cut. Pull out easy-to-pull plants. If you can’t hand-pull tree-of-heaven, then you can dig out the plant or pull it out with a Weed Wrench®. Spring or early summer cutting of tree-of-heaven will slow its growth, but may not inhibit flower, fruit, and seed production. Repeated cutting of big plants or mowing seedlings on a monthly cycle will be more effective at stunting the plant and inhibiting fruit and seed production. Mechanical controls can be done at any time during the year; however, the best times are the months before or during flowering. You don’t want the tree to produce seeds! 3. Biological Control: There are no commercially-available insects, mites or disease organisms yet found to be effective biological control agents. The three most important, but sporadic, natural controls are (1) Verticillium wilt (Verticillium albo-atrum, V. dahliae) (2) Armillaria root rot (Armillaria mellea) and (3) the insect called the Cynthia Moth (Samia cynthia). The Cynthia Moth’s larval stage can defoliate this tree very quickly (Hartman, Pirone and Sall, 2000). Tree-of-heaven is a host to other insects and diseases of minor importance. 4. Chemical Controls: The best time for any control option is just before a plant flowers. In addition, the application of herbicides in July, August, and up to mid-September gives maximum warm weather chemical control. These are the months that greater concentrations of carbohydrates and other plant compounds are being manufactured in the leaves by way of photosynthesis and are transported from the leaves to the roots for root growth and cold weather storage. This downward flow of plant compounds helps facilitate the transport of foliar and stump applied herbicide to the roots during these months for more effective kill. The mechanical control of cutting or mowing is also very effective during these months for the same reason (i.e. weakening the plant). For example, when you cut the top off any plant, the roots naturally respond by pushing up more top growth (sprouting), reducing the root reserves (carbohydrates and other growth compounds) and stressing the plant. In other words, every time you cut the top off you force the plant to sprout which reduces the root reserves and weakens the plant. Suggested chemical control during July, August, and up to mid-September is to cut tree-of-heaven down to one inch from the ground and immediately apply straight (undiluted) glyphosate herbicide to the freshly cut stump using a paint brush or sponge applicator. Roundup®‘poison ivy killer’ works very well. On the other hand, suggested chemical control in the spring months of March, April, May, and June is to cut the stump high (six to twelve inches above the ground) and let the stump sprout. Then take advantage of interrupting the downward flow of plant compounds and cut the newly sprouted plant in July, August, or early September back to one inch from the ground and stump-applicate with straight glyphosate herbicide. This timing ensures maximum kill by the undiluted herbicide of the now weakened roots induced by the Spring cutting (i.e. the stump that sprouted using the reserves in the roots; roots have less recuperative capacity and are more susceptible to herbicide kill). 2. Hand-pull what you physically are able before tree-of-heaven produces seeds; preferably before August. 3. Dig out or use a Weed Wrench® on hard to pull plants, preferably before August. 4. Plants that prove to be too difficult to remove by way of pulling or digging may be cut down to one inch stumps and a glyphosate herbicide immediately applied to the freshly cut stumps using a paint brush or sponge applicator. Stump application is very effective during July, August, and up to mid-September. If you cannot stump-applicate the hard to pull plants during the summer months, then you can instead cut the plant six to twelve inches from the ground before it starts to produce seeds in August. After the taller stumps have re-sprouted, you must cut them to one inch above the ground and immediately apply glyphosate herbicide to the freshly cut stump. Allowing the stump to re-sprout during the summer months draws carbohydrate and other growth compounds from the roots and depletes some of the root energy making herbicide kill more effective. 5. Foliar application of glyphosate works best on multi-stemmed plants or large tree-of-heaven plants that were repeatedly cut for many years without chemical control follow up or were not removed by digging. Foliar application works best between July and mid-September. Foliar application transports the herbicide from the leaves to the roots. If tree-of-heaven has many stems and is quite large, it may take one to two years for complete kill after one foliar application because multiple stemmed specimens generally have very large root systems. Foliar application enters the leaves more easily during humid weather because the leaf cuticle/wax layer is thinner making the leaf more absorbent to the foliar-applied herbicide (Ware, 1996). Individuals contemplating using chemical control of tree-of-heaven in or near wetlands must use a wetland approved herbicide. It’s the law. 6. Cold weather stump application (November through February; mean temperatures of15.8 to 46.4 Fahrenheit (Reinartz, 1997) reduces the risk of contaminating non-target plants. University of Wisconsin researcher, James Reinartz (1997), tested cold weather stump application using 25% concentration of glyphosate herbicide on glossy buckthorn and obtained 92 to 100% control. I have used straight glyphosate concentration on freshly cut glossy buckthorn stumps and obtained a 98 to 100% kill from November through January. Cold weather stump application frees up time to control most woody invasive plants when there is no available time to do so during the summer months. I have tried cold weather stump-application using straight glyphosate poison ivy killer on tree-of-heaven with excellent results; 99% kill. Only once did I have to reapply herbicide to a 6- inch DBH tree that I had treated during the winter. This tree had many root sprouts (which I treated); however, a few new sprouts appeared during the summer months from very large roots. When I reapplied herbicide in late August there were no sprouts the following year. Cold weather stump application is especially useful on overgrown individuals or stands. It is worth trying on this species. 7. The above suggested IPM example may be modified to suit existing site conditions and the level of infestation. As with any IPM program, you have the choice to use or not to use the chemical pesticide option. For more information about tree-of-heaven visit: www.invasive.org. Anonymous. 2006. Weed of the Week. Tree-of-Heaven, Ailanthus altissima. USDA Forest Service, Forest Health Staff, Newtown Square, Penn. Burbidge, F. W. 1910. Tender Plants for the Summer Garden. Pp. 41-56 in E. T. Cook (Ed. ), The Century Book of Gardening. The Country Life Library, London. Burch, P. L. and Zedaker, S. M. 2003. Removing the invasive tree Ailanthus altissama and restoring natural cover. Journal of Arboriculture 29 (1): 18-24. Dame, L. L. and Brooks, H. 1902. Handbook of the Trees of New England. Ginn and Company, Boston, Massachusetts. Devine, R. S. 1998. Alien Invasion. America’s Battle with Non-Native Animals and Plants. National Geographic Society, Washington, D. C.
Dirr, M. A. 1998. Manual of Woody Landscape Plants. Their Identification, Ornamental Characteristics, Culture, Propagation and Uses. Stipes Publishing, Champaign, Illinois. DiTomaso, J. M. and Kyser, G. B. 2007. Control of Ailanthus altissama using stem herbicide application techniques. Arboriculture and Urban Forestry 33(1): 55-63. Fryer, J. L. 2010. Ailanthus altissama. In: Fire Effects Information System, [Online]. U.S. Department of Agriculture, Forest Service, Rocky Mountain Research Station, Fire Sciences Laboratory (Producer). Available: http://www.fs.fed.us/database/feis/ [2013, December 23]. Harlow, W. M. 1959. Fruit Key and Twig Key to Trees and Shrubs. Dover Publications, Inc. New York. Harlow, H. M. and Harrar, E. S. 1969. Textbook of Dendrology (5th ed.) McGraw-Hill Book Company, New York. Hartman, J. R., Pirone, T. P., and Sall, M. A. 2000. Pirone’s Tree Maintenance (7th ed. ), Oxford University Press, New York. Hunter, J. 1996. Ailanthus altissima. Ailanthus, Tree-of-heaven. P. 27 in J. M. Randall and J. Marinelli, eds. Invasive Plants. Weeds of the Global Garden. Handbook # 147. Brooklyn Botanic Garden, Brooklyn, New York. Little, S. 1974. Ailanthus altissama. Pp. 201-202 in C. S. Schopmyer, ed., Seeds of Woody Plants in the United States. Forest Service, U. S. Department of Agriculture, Agriculture Handbook No. 450. Magge, D. W. and H. E. Ahles. 2007. Flora of The Northeast. 2nd ed. University of Massachusetts Press, Amherst. Miller, J. H. 1990. Pp. 101 105 in Burns, R. M. and Honkala, B. H. (Eds. ), Silvics of North America, Vol. 2: Hardwoods. USDA Agricultural Handbook No. 654. Petrides, G. A. 1986. Trees and Shrubs (2nd ed. ), The Peterson Field Guide Series. No. 11A. Houghton Mifflin Company, Boston, Massachusetts. Reinartz, J. A. 1997. Controlling glossy buckthorn (Rhamnus frangula L.) with winter herbicide treatments of cut stumps. Natural Areas Journal 17: 38-41. Somers, P., R. Kramer, K. Lombard and B. Brumback. 2006. A Guide to Invasive Plants in Massachusetts. Published by the Massachusetts Division of Fisheries and Wildlife. Symonds, G. W. D. 1963. The Shrub Identification Book. The Visual Method for the Practical Identification of Shrubs, Including Woody Vines and Ground Covers. William Morrow & Company, New York. Ware, G. W. 1996. Complete Guide to Pest Control (3rd ed. ), Thomson Publications, Fresno, California. Whitcomb, C. E. 1985. Know It and Grow It II: A guide to the Identification and use of Landscape Plants. Lacebark Publications, Stillwater, Oklahoma. Wilson, E. H. 1932. Aristocrats of the Garden. Volume 1. The Stratford Company, Boston, Massachusetts. Zheng, H., Y. Wu, J. Ding, D. Binion, W. Fu and R. Reardon. 2006. Invasive Plants of Asian Origin Established in the United States and Their Natural Enemies. Volume 1. U.S. Department of Agriculture Forest Health Technology Enterprise Team FHTET 2004-05, Morgantown, West Virginia, 147p.